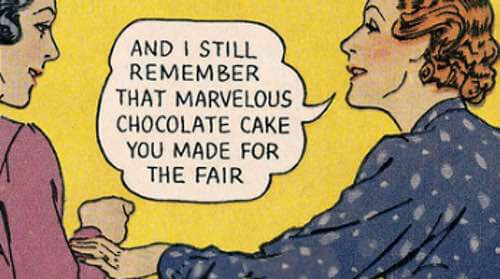 Mom's homemade chocolate cake recipes include one for making Aunt Wilhelmina's never fail chocolate cake. Her dessert cake is not only delicious, but it's also quick-and-easy to make. So if you need a special cake in a hurry, this is it. And it's delicious with or without icing. That's why Mom begged her for the recipe back in the 1950s. Now, it's yours to enjoy! 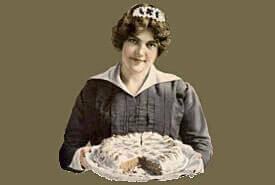 You'll love my Aunt Wilhelmina McIlmoyle's Never Fail Chocolate Cake. 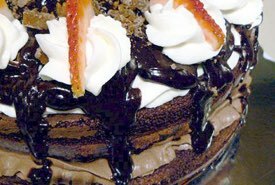 She served this cake to us on special occasions, and it was always delicious. She claimed it always turned out well — and it did. Mix the ingredients in each bowl, then combine the two, and bake 350°F for 1/2 hour. 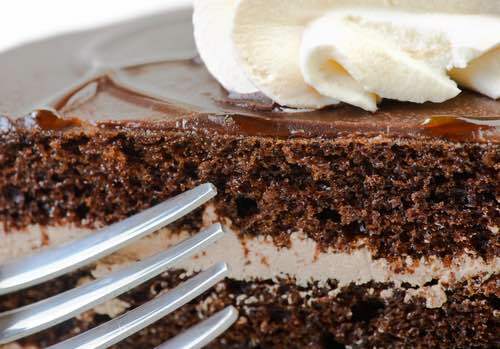 Here's a basic homemade chocolate cake recipe that's dependable when you need a cake in a hurry. One that's moist and delicious and most old fashioned recipes, calls for only simple ingredients. 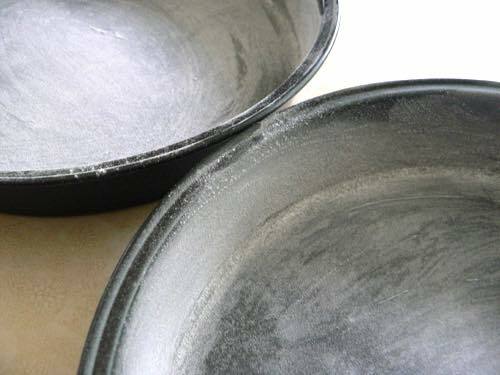 Preheat your oven to 350°F, then grease and flour a couple of 9-inch round baking pans. In a medium bowl, sift together the flour, cocoa powder, baking soda, and salt. Then, in a large mixing bowl, combine the butter, sugar, vanilla, and eggs. Beat on medium-high speed until well creamed. 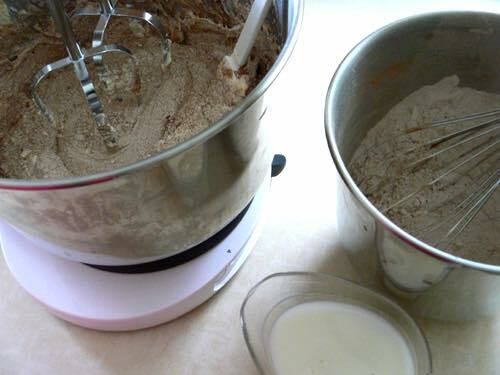 Then, gradually add the milk and dry ingredients to the wet ingredients in the large bowl while mixing on medium speed. Continue mixing for about 2 minutes, then pour the batter evenly into the 2 pans and place them in your preheated oven. Bake at 350°F for 30 to 35 minutes, or until your cakes test ready. You can easily tell whether your cakes are done when you insert a toothpick, and it comes out clean. Or, by simply pressing down on the middle of the cake with your finger and if it springs back, it should be done and ready to remove from the oven for cooling. 2 cups sifted cake flour, 2 teaspoons baking powder, 1/2 teaspoon salt, 1/2 cup butter, 1/2 cup sugar, 2 squares Baker's unsweetened chocolate (melted), 1 egg well beaten, 1 teaspoon vanilla, 3/4 cup milk, marshmallows. Sift flour once, measure, add baking powder and salt and sift together three times. Cream butter thoroughly, add sugar gradually, and cream together until light and fluffy. Add chocolate and blend; then add egg and vanilla. Add flour, alternately with milk, a small amount at a time. Beat after each addition until smooth. Bake in greased pan, 8 x 8 x 2 inches, in moderate oven (325°F) 1 hour. Turn from pan and while still warm, cover bottom with marshmallows that have been rinsed with cold water and cut in halves crosswise. 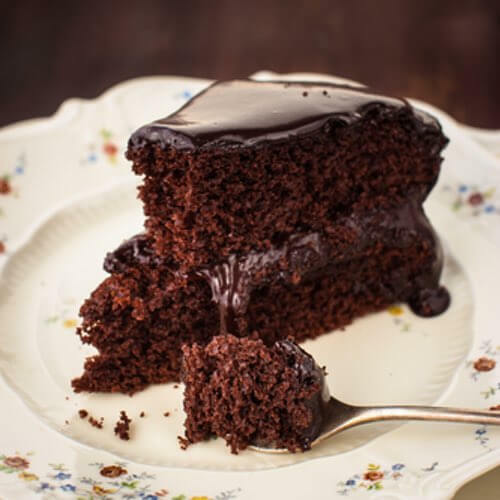 When cake is almost cold, cover with chocolate icing (below). Sift the soda and cream of tarter with the flour. Bake in two layers, and ice with white boiled icing. Use orange filling between layers. Immediately before adding the soda, add to the ingredients 3/4 cup boiling water. Bake in two layers. Beat shortening and sugar until light and airy. Sift dry ingredients. Add alternately with water to shortening mixture. Add lemon juice. Fold in egg whites beaten stiff but not dry. Pour into greased 8x12-inch oblong pan. Bake in a moderate oven (350°F) 30 to 40 minutes. After cake has baked 5 minutes, sprinkle top with crushed peppermint candy. 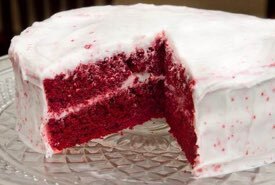 After cake is cooled and iced, it can be cut in squares. 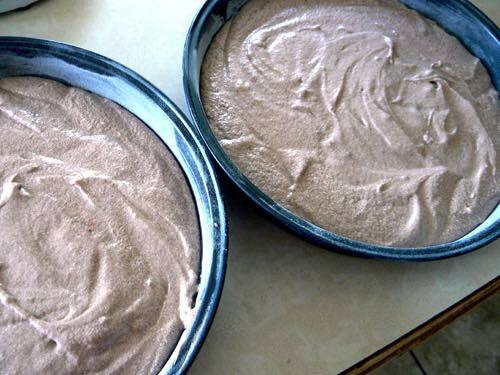 Chocolate Icing: Blend 1/4 cup of shortening with 2 egg yolks and 1/4 teaspoon salt. Add 3 squares melted bitter chocolate. Add 2 cups confectioner's sugar alternately with 3 tablespoons thin cream. Beat until thick enough to spread on cake. 1 cup sugar, 3/4 teaspoon salt; 1/4 cup grated chocolate, 3/4 cup butter or shortening; 5 eggs; 2 cups flour; 1 teaspoon baking powder, 1/2 cupful sultana raisins; 1/2 cup candied chopped citron peel. All measurements level. 2 tablespoons butter or shortening; 2 squares melted bitter chocolate; 2 cups powdered sugar; 6 tablespoons coffee; 1/4 teaspoon salt; 1/2 teaspoon vanilla. Knead butter or shortening into sugar. Melt chocolate, add coffee, sugar, salt, and butter or shortening and stir until thick, then add vanilla and put away to cool. When cold spread on cake. Here's a quick, simple tip Mom sometimes used when serving cake to company. This method of serving cake saves time and makes for equal sized servings. 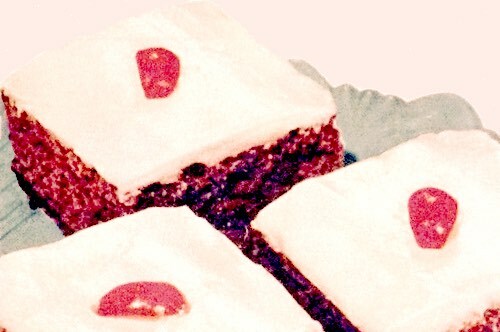 Cut your cake in squares beforehand, and decorate each piece with icing and a colorful maraschino cherry on top. 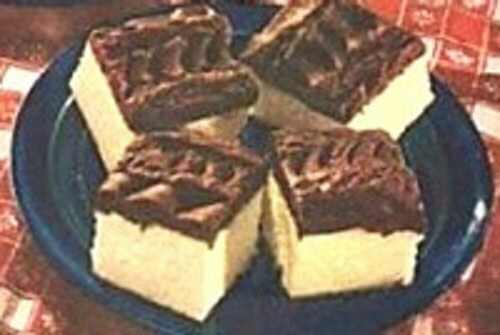 Ice only the top or cover the sides of the cake squares as well for a fancier presentation. Make perfect little cake squares for taking to a last-minute picnic or party, or to slice for school lunches as a special treat. Yum... chocolate! 1/4 cup of butter, 1-1/2 cups of powdered sugar, 1 egg, 1 cup of milk, 2 cups of bread flour, 3 teaspoonfuls of baking powder, 1/2 teaspoonful of vanilla, 2 squares of chocolate - melted, 1/2 cup of powdered sugar, 2/3 cup of almonds blanched and shredded. Put between layers and on top of cake White Mountain Cream frosting sprinkled with almonds. Put sugar and water in saucepan, and stir to prevent sugar from adhering to saucepan; heat gradually to boiling-point, and boil without stirring until syrup will thread when dropped from tip of spoon or tines of silver fork. Pour syrup gradually on beaten white of egg, beating mixture constantly, and continue beating until of right consistency to spread; then add choice of flavoring and pour over cake, spreading evenly with back of spoon. Crease as soon as firm. If not beaten long enough, frosting will run; if beaten too long, it will not be smooth. Frosting beaten too long may be improved by adding a few drops of lemon juice or boiling water. This frosting is soft inside, and has a glossy surface. If frosting is to be ornamented with nuts or candied cherries, place them on frosting as soon as spread. Here's an old fashioned newspaper clipping from the 1920s with 2 recipes for making traditional chocolate cakes. Sift together three times, the flour, the baking powder, and the salt. Beat egg yolks and one white, saving the other white for frosting. Put butter into mixing bowl, add sugar; pour boiling water on the shaved chocolate, stir quickly and when melted add to butter mixture. Add beaten eggs, then dry ingredients alternately with milk, add vanilla. Beat all together. Pour into a greased cake tin and bake in a moderate oven. To make the cake frosting, boil 1 cup of sugar with 1/3 cup water, without stirring, until the syrup threads when dropped from tip of spoon. Have egg white beaten stiff. Pour syrup gradually on beaten egg, beating constantly until of consistency to spread. Add 1 teaspoon vanilla or 1/2 tablespoon lemon juice and spread over cake. To make a marshmallow icing of this, cut up 3 marshmallows and stir them into the hot syrup just before pouring it into the beaten egg white. When mixture is beaten to a smooth fluff, allow it to set for a few minutes before spreading on the cake. Directions: Cream butter and sugar, add beaten eggs, then the cocoa dissolved in hot water; beat well. Sift flour and soda together and add alternately with the milk. Add vanilla and bake in a moderate oven.